Unstructured play is a large component in the development of gross motor skills and cognitive thinking during the early stages of childhood development. Therefore, age specific playground structures such as the Bungalow, provide children 2 to 5 years old an outlet for learning while playing in an outdoor setting. 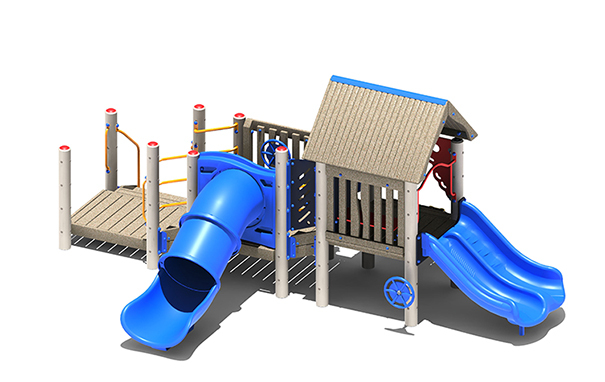 Compact, sturdy and inclusive, the Bungalow Playground Structure features low platform heights and is equipped with 5 fun, challenging activities. Children have the ability to hike up the Rock Climb or enter the ground level stairs, gaining access to steer the Big Wheel, crawl through the Big Tube and zip down the Duo Chute slide. These play components easily help encourage the naturally curious child to explore and engage in independent and group play, with other children or caregivers. Designed to promote accessibility and inclusion, ground stair access and an ADA compliant transfer point allow all abilities to enjoy play in the outdoors on the Bungalow. Developed with strong, eco-friendly materials, the Bungalow Playground Structure is available in conditioned wood or 100% recycled plastic and metal. Use Zone: 28'6" x 27'0"